Matters are often handled in multiple offices or firms that need to share key litigation data and documents, with our hosted CaseCloud you have the freedom to collaborate with colleagues and co-counsel to build a winning case. Helps attorneys better capture and organize all of the critical details in their case and make quick connections between facts, documents, witnesses, issues and research. CaseMap® case analysis software helps litigation teams bring together the relevant facts, documents, players and issues of each case-as well as legal and investigative research-into a centralized repository for improved case assessment. TextMap® transcript management software enables you to uncover key testimony faster, collaborate more effectively with trial team members and summarize transcripts more effectively. 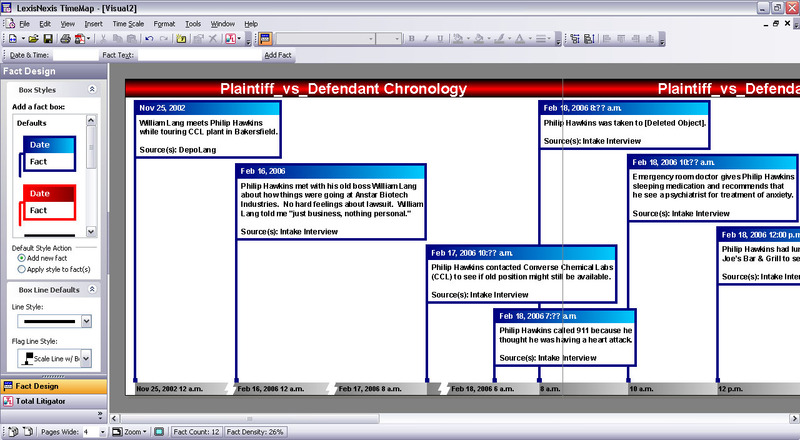 TimeMap® timeline graphing tool quickly transforms litigation details into polished visuals timelines to help your litigation team, witnesses, clients, the judge, jurors and other key players understand the sequence of events in a case. Just add your case facts to a simple spreadsheet and let the TimeMap tool do the rest, including organizing text, sizing pictures and applying colors, fonts and much more. No graphic expertise required! CaseMap contains five spreadsheets, which provides the framework for organizing and evaluating critical case knowledge. These spreadsheets help you keep your clients up-to-date, plan for discovery, prepare to take and defend depositions, create motions for summary judgment and make your case at settlement conferences and trial. 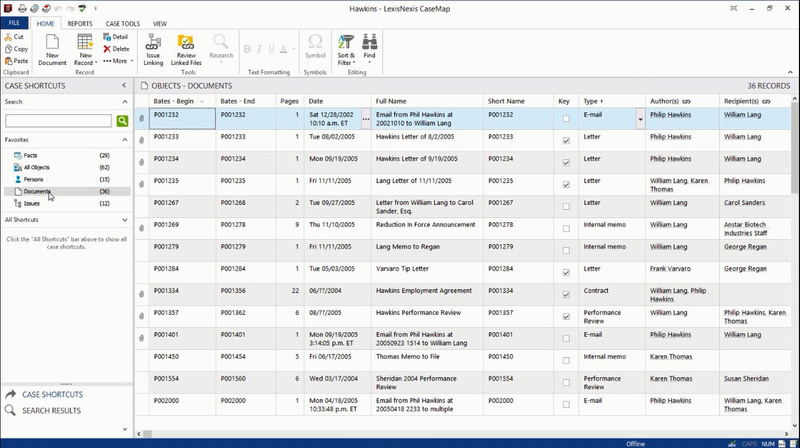 This optional add-on gives you even more control over your case information. With a near-native viewer that supports most standard file types used in litigation, CaseMap DocManager provides a single interface where you can view, annotate, hit-highlight, Bates stamp, batch print and batch convert files to PDF and TIFF. TextMap software enables you to produce a variety of practical, polished reports and generate a single index covering multiple transcripts. You can also gain efficiency and impact in the courtroom with easy exhibit linking and synchronized video. Easily find the testimony you need to make your case, with our TextMap transcript management software you can create a searchable database of your electronic transcripts. 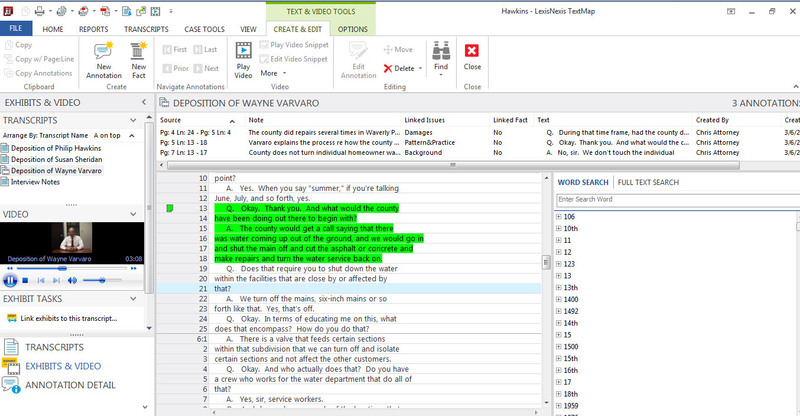 Just upload a transcript, and you can easily search, summarize, annotate, issue-code and attach notes to important passages of your case testimony. Create a timeline in TimeMap by choosing from over 30 templates that include flag styles, title style, background color and more. Then simply enter the dates and descriptions of events. TimeMap creates fact flags for your entries, generates a time scale based on facts dates and positions the fact flags at the appropriate dates along the time scale. You can create a variety of work product-practical timelines for client meetings and depositions, as well as courtroom exhibits and graphics for court filings and court documents.